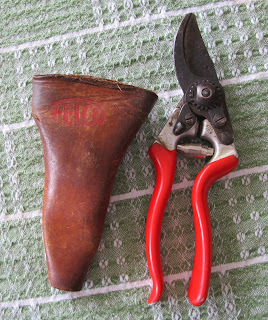 It's time to retire... this old Felco No. 8 pruner with holster. It had a good run, if you consider 15 years a good run for pruners. I do, especially knowing all the work this ol' pruner did over those years. The cutting, the shearing, and occasionally the digging of maybe a really small hole when no trowel was nearby. I am certain I didn't take the best care of this pruner. I dropped it more than once, onto concrete, too. I put it away with plant sap stuck to the blade, and probably didn't do the best job of sharpening it when I did sharpen it. There are a few knicks in the blade, and it is blackened from use. The red plastic coating is peeling away from the handles. Yes, it's time to retire this old Felco no. 8 pruner with the clip-on holster. I expect this pruner will be good for at least 15 years, or longer, especially if I take better care of it. What will I do with my ol' pruner now that I've retired it? Throw it and its old holster away? Never. We've been through too much together in this garden. I think I'll clean it up, sharpen the blade as best I can and use it on the plants in the sun room. Working with houseplants won't take nearly the effort of working out in the garden with trees and shrubs and perennials and vegetables. Yes, this ol' pruner, even though retired, ought to last quite a while longer being used just for houseplants. I agree with ks. I've replaced the blades on my pruner, and the spring as well. You can find parts on Amazon and I think Lee Valley and A.M. Leonard carries them, too. Great bolg post. I wonder if the holster will ever look as good as it's predecessor? I can never throw away a garden tool, even if it is broken. Nope just can't do it. And I will often take it up one more time just to see if it really is not up to the job. Great idea, Carol! I can't throw away anything that can still be used. Yes, I think the old pruners deserve a nice warm place in the sun for their golden years. I've never owned a pair of Felcos, but I am really coveting that holster--what a great way to keep from losing my pruners! Indy May? I was dismayed you are retiring those trusty pals. Get them some new blades! Chop chop! 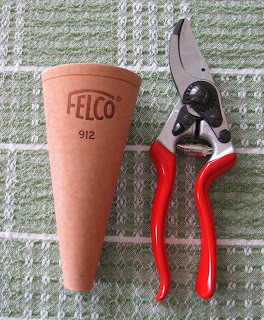 I've always kept two Felcos because one lways goes missing! And now that my husband is in the garden more, it doubles the chance of one going missing! I tend to buy cheaper brands - I inevitably loose them! Those felcos do look good and are certainly up for the job! That's the way to gently put them out to pasture. They will like their new retirement home in the sunroom, I'm sure of it. And tell me, how do you prune them? Mine are Fiskars, not Felco, but they do need sharpening and I don't know how!